Fenerbahce of Turkey defender,Joseph Yobo is confident Nigeria has taken a major step towards a fifth appearance at the FIFA World Cup next year but warns his colleagues in the Super Eagles that the ticket is not signed, sealed and delivered yet. Yobo, the most capped Super Eagle praised the team that defeated Ethiopia last Sunday in Addis Ababa for displaying the never say die Nigerian spirit in the rarified air in Ethiopia. 'I think the Eagles have shown they are worthy champions of Africa. That the feat they achieved at the 2013 AFCON was not by happenstance. I am indeed proud to be associated with the crop of dedicated and committed players we now have in the national team,'said Yobo who singled out the team`s gaffer, Stephen Keshi for special praise. 'No matter what anybody says, coach Keshi has done a tremendous job of building a team most Nigerians are now proud of. I have been in the national team for over 10 years and should know better. 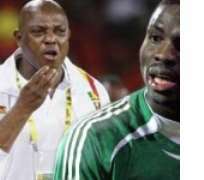 He (Keshi) has moulded a team that can be better than the team he captained to our first world cup appearance in 1994.'. Yobo however wants all hands to be on deck towards the second leg against Ethiopia and for the players not to lose focus. `If I am not there personally to be with the team as their leader, I will be with them in spirit because the team's success is also mine and that of Nigerians,'he further said and praised Cross River state governor, senator Liyel Imoke for his contribution towards the success of the team. 'The Nigeria Football Federation also deserves praise for providing the team with all the support that has taken us this far,'he concluded.